Amsterdam Sloterdijk station is located in the north-west of Amsterdam and is a major rail junction. Amsterdam Sloterdijk is one of the city’s business districts and is surrounded by large corporate and government offices. It is also a hub for international coaches with Flixbus and OUIBUS operating from just outside the station at Piarcoplein. Being easily accessible to both Amsterdam Central and Schiphol airport, and with a number of hotels in the area it has become a popular base for tourists and business travellers. In this article we will see how visitors can get to Amsterdam Sloterdijk from various points around the city. TRAIN: The train is the quickest way to get to Sloterdijk from Amsterdam Schiphol Airport taking only 10-11 minutes. Sprinter trains run up to 6x hourly with final destination Amsterdam Centraal or Hoorn Kersenboogerd. The cost of a one-way train ticket (2019 prices) from Schiphol Airport to Amsterdam Sloterdijk is €3.70 (2nd class) or €6.11 (1st class) plus a €1 surcharge if purchasing a disposable train ticket. The journey would also be covered by the multi-day Amsterdam Travel Ticket, see public transport ticket options available for Amsterdam for further info. 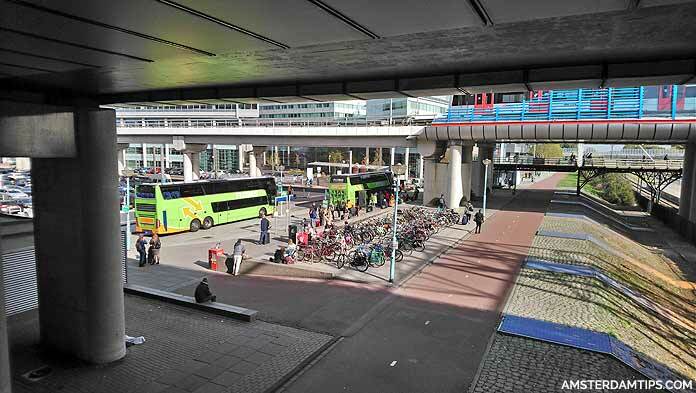 BUS: GVB bus 69 runs from Schiphol Plaza to Amsterdam Sloterdijk station 2-4x per hour. However the journey time is 40 minutes, so we would recommend sticking to the much faster train. GVB 1 hour tickets cost €3.20. TAXI: A taxi from Schiphol Airport to Amsterdam Sloterdijk will cost about €40. Uber is also present in the city and an UberBlack trip would be in the range €37-49. Amsterdam Sloterdijk lies about 4.5km west of Amsterdam Central station. TRAIN: The fastest and most convenient way to travel from Amsterdam Central to Sloterdijk is to take the train. The trip by rail takes just 6 minutes. 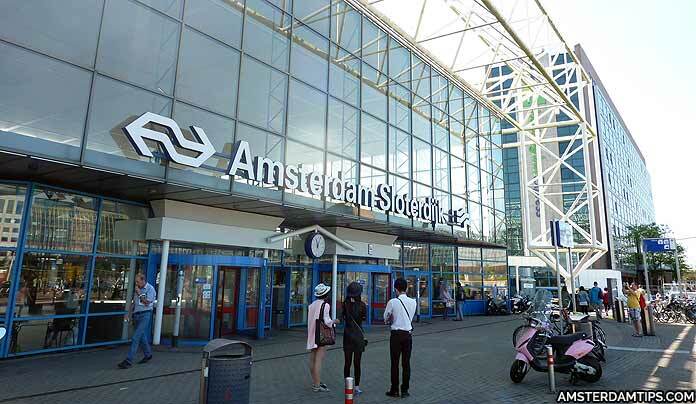 The cost of a one-way train ticket (2019 prices) from Amsterdam Central to Amsterdam Sloterdijk is €2.40 (2nd class) or €3.96 (1st class) plus a €1 surcharge if purchasing a disposable train ticket. See how to buy train tickets in the Netherlands for more detailed info. Many trains depart Amsterdam Central (literally every few minutes) that make a stop at Sloterdijk station. These can be both Intercity trains and Sprinters. The final destination can include Alkmaar, Den Haag Centraal, Den Helder, Enkhuizen, Hoofddorp, Hoorn, Uitgeest, Vlissingen, Zandvoort aan Zee. Double check the overhead board on the platform to confirm the train stops at Sloterdijk. Likewise there are numerous trains at Amsterdam Sloterdijk running from different platforms to Amsterdam Central. BUS: GVB bus 22 (Sloterdijk-Muiderpoort station) operates between Amsterdam Sloterdijk and Amsterdam Central station up to 9x hourly. The trip takes 25 minutes – this is slower than the train but can be useful for those with GVB tickets. During the night there is a GVB nightbus 281 running hourly. Singles cost €4.50. TAXI: A taxi between Amsterdam Central and Amsterdam Sloterdijk will cost about €20-25. An UberBlack ride would cost €20-26. Transport company GVB runs metro, bus and tram services around Amsterdam and offers good value multi-day tickets. These are valid on a full 24 hour basis ranging from 1 day (€8) to 7 days (€36.50); a children’s 1 day ticket is €4. These tickets are not valid for train travel so you would need to use separate train tickets for the Schiphol-Sloterdijk and Sloterdijk-Central train journeys. Where can you travel with the GVB day tickets from Amsterdam Sloterdijk? Metro line 50 can get you to Amsterdam Lelylaan, Amsterdam Zuid, Amsterdam RAI, Duivendrecht and Bijlmer-Arena. At Zuid you can change to Metro line 52 which can take you through the heart of the city towards Amsterdam Central. See our Amsterdam Metro map. GVB tram 19 runs from Sloterdijk to Diemen and follows an arc (west-east) through the city centre. You can stop at Leidseplein, Spiegelgracht or Vijzelgracht to reach many places of interest. Book GVB multi-day tickets online here for pick-up at a GVB service point at Amsterdam Central or Amsterdam Zuid. Amsterdam Sloterdijk is easily reached by road being close to the A5 and A10 ring road (exit S102). There is a Park and Ride (P+R) car park at Sloterdijk with spaces for 200 cars. The address is Piarcoplein 1, 1043 DW Amsterdam. Note, to get the P+R rate you must use public transport to go to central Amsterdam.